All aboard for another Kennington Bioscope special! 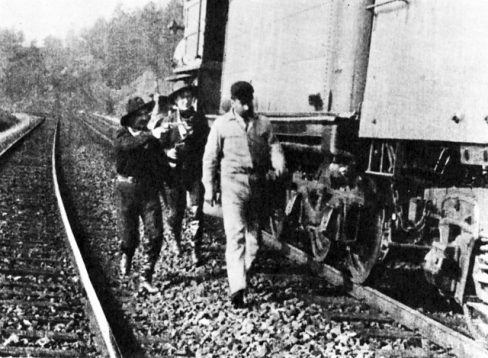 An all-day excursion into the greatest railroadin’ moments of silent cinema. Thrill to the train of events that put movie heroines Ruth Roland, Helen Holmes and Gloria Swanson in peril! Express hilarity with Monty Banks aboard a runaway train, and sneak A Kiss in the Tunnel from 1899! Signal your approval of Jean Arthur in The Block Signal (1926). Climb aboard The Flying Scotsman (1929), in the rare silent version that differs radically from the talkie. Take a round trip with Kevin Brownlow as he pilots The Runaway Express (1926) before conducting us through the making of Abel Gance’s La Roue (1923). Ride along with the Railroad Raiders of ’62 (1911) – a precursor to Buster Keaton’s The General – which will be rolling in from the sidings alongside other shorts, from the Lumière brothers’ famous L’arrivée d’un train en gare de La Ciotat (1896) to a hair-raising journey When the Devil Drives (1907). 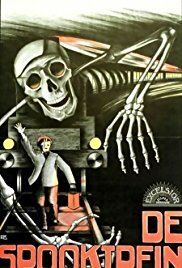 After that, don’t be afraid of The Ghost Train (1927), the first film adaptation of the famous stage play by a (very) pre-Dad’s Army Arnold Ridley. 11.45 Thrills & Frills Michelle Facey presents a programme of women on the railways. Whether they’re causing trouble or saving the day, women weren’t always just relegated to being tied to the tracks… Helen Holmes, Fay Tincher and Gloria Swanson and others feature in five complete short films. All films will have live accompaniment by our highly acclaimed team of musicians – John Sweeney, Neil Brand, Costas Fotopoulos and Cyrus Gabrysch. Silent films with intertitles which may be suitable for the deaf and hard of hearing. From 10.00 to 22.00 approx. Ticket prices are £18 for a one day pass, £10 for a morning pass, £12 afternoon/evening pass. £5 main evening feature 8pm. £6.50 Dinner at Jamyang. To book online (or pay by cheque), go to the TicketTailor page https://www.tickettailor.com/events/kennington-bioscope/169669#-bioscope/138976.